Lockrods are the locking mechanisms for trailer swing doors. They are designed for different applications (dry van, truck body, horse, livestock, utility and intermodal). In keeping with our motto of “More Options, Better Solutions” we have been manufacturing different weights, finishes, sizes and lengths to meet your needs for a lockrod that has longevity, is easy to use, safe and durable. All of our Powerbrace lockrod models are designed to provide positive anti-racking control in every direction. We offer complete steel, stainless steel and aluminum lockrods in custom lengths, as well as components in kit form to build your own lockrods. We offer product options that complement any trailer end-frame sill and header heights. – Lockrods may be ordered with the top cam unattached for field length adjustment (Top End Loose, TEL). – Keepers specific to the model are ordered separately with desired offset, material and finish. – All steel lockrod models feature heavy-duty high-yield (55,000 psi minimum) low alloy tubing for maximum strength, long life and optimum performance. – Standard finish on steel is hot-dip galvanized, but other material options are also available. – “Snap-in” Acetal anti-seize bushings used in guide plates and rod guides allow easy assembly and smooth operation, prevent galling and eliminate the need for lubrication. 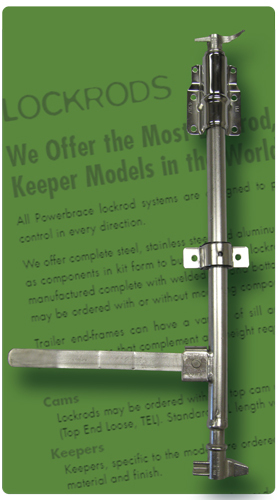 We at Powerbrace have been adapting lockrods as market needs have evolved for over 50 years. Please see left sidebar for more pertinent lockrod information or call us at 262.694.3202 with your questions.